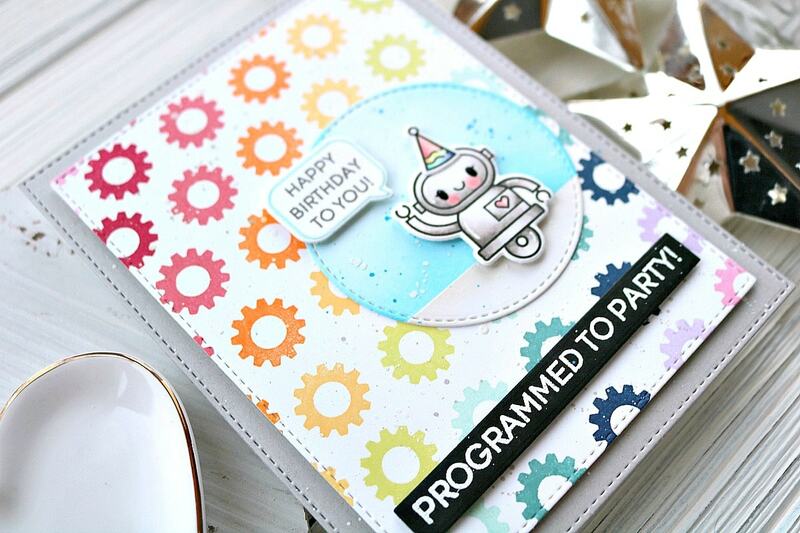 Today I’m sharing a card featuring the new release and some rainbow stamping! Hi, all! It’s Cassie here, and I’m so happy to be back on the Heffy Doodle blog sharing a card with you all. Today I am sharing this card I made for the new release! I love the new Bots of Love stamp set. It’s got so many fun images and some really sweet sentiments. Today I decided to make a birthday card using the set along with some other Heffy Doodle products. I started by die cutting two stitched rectangles from the Stitched Imperial Rectangle dies in different sizes, one from gray card stock and the other from some white card stock. On the smaller, white rectangle I used one of the gears to stamp out a pattern with some rainbow inks. I used all Catherine Pooler inks for this, going through the rainbow. Luckily it worked out perfectly and I got through all the colors! I adhered the patterned rectangle to the gray one with some foam tape and started working on the rest of the elements for the card. 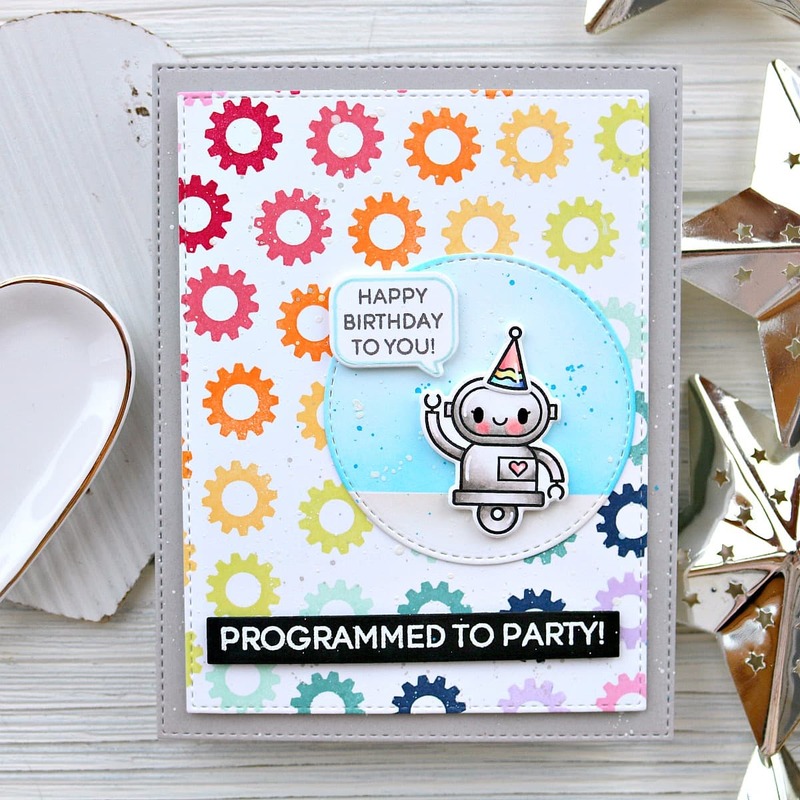 I stamped out one of the robots from Bots of Love, a speech bubble and sentiment from Whatcha Sayin’, and heat embossed the ‘programmed to party’ sentiment from Bots of Love. I like to try to do all my stamping and die cutting at the same time in an attempt to streamline the process! I colored in the robot with my copics, giving him a party hat to wear, and die cut everything out, including the heat embossed sentiment which I used the Strips of Ease die for. I also die cut out a circle from the Stitched Circle dies for my robot. I ink blended the ground and a sky by using a post it note and some Distress Oxide ink. I adhered the circle and heat embossed sentiment to the card, and decided I wanted to splatter some ink over the card. I used white, blue and gray paint to add some more color. 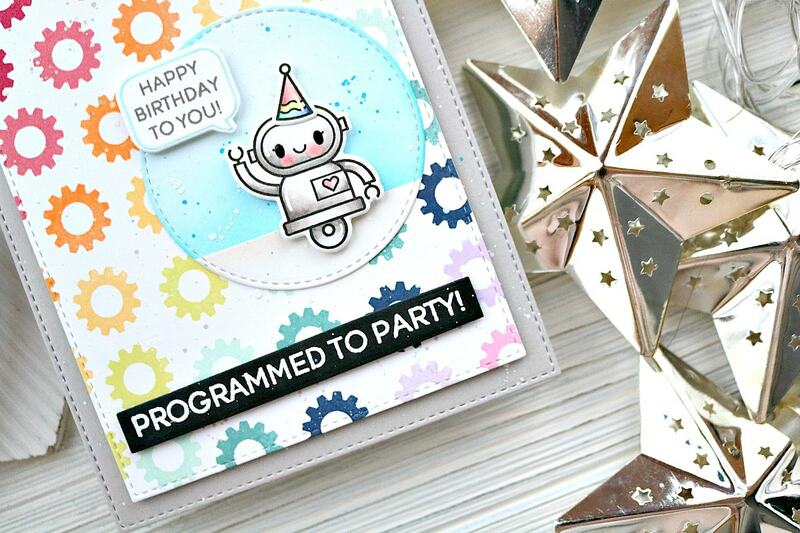 Then I added the robot and word bubble, finishing the card! I hope you enjoyed this card for today! I don’t know about you, but I think those rainbow colors are just dreamy!! Thank you so much for stopping by today, and I’ll see you again soon with another card!